Hi! Thank you for your interest in knowing more about me. I am a National Certified Counselor in the US & a Licensed Clinical Psychologist in India. I offer one-on-one therapy, as well as family, couples, children and group counseling in my private practice in Hyderabad, India. I also offer counseling and coaching online via Skype. In my decade of study and work in the field of psychology and counseling I have worked with clients to clarify their states of being and help in crisis as well as identify a peaceful and wholesome way of living. I have a Dual Masters in Psychological Counseling from Columbia University, USA. I also have an MPhil in Clinical Psychology from Osmania Univeristy, India. I have additional training as a Trauma Counselor from the Institute of Contemporary Psychotherapies, USA; as a Certified Mindfulness Teacher at the Ottawa Mindfulness Clinic, Canada and Intuitive Eating Counselor (in training) with Evenlyn Tribole (in USA). I am also trained in Solution Focused Brief Therapy as well as the Developmental Model of Couples Therapy. It is an immense honor and pleasure to work with women, children and families in therapy to clarify their lives, help them live intentionally and nurture loving relationships. At the age of 13, I was initiated into the practice of Samadhi Meditation and Hatha Yoga. During my years as a student in psychology, as part of my yearning to gain a holistic perspective on the unfolding of human experience, I studied yoga at Yogaworks, USA. I am a 200hr certified yoga teacher and I use my experiences in training and practice to help individuals live a deeper and a more enriched life. Further,I am trained in spirituality and psychotherapy from the Association for Spirituality and Psychotherapy, USA. This is where I was initiated into the practices of Mindfulness by Lynda Klau, PhD. and Henry Grayson, PhD. I am a qualified Mindfulness Based Symptom Management teacher from the Ottawa Mindfulness Clinic. I am the founder of Pause for Perspective. Through Pause for Perspective, I run workshops and talks that are informed by coursework as well as a personal practice of mindfulness to life and living. My workshops range from introductory to 8-week programs and help individuals get a taste for mindfulness and begin the practices of living mindfully in their daily lives. In my training as a psychological counselor I was especially inclined to the practice of art and its therapeutic benefits. With a 20 year practice in journaling and deep interest in art as well as its therapeutic values, I run workshops on Creative Journaling (Mindfulness Based Art) and Contemplative living in the city of Hyderabad. My workshops on Mindfulness Based Art (creative journaling) are a safe space for individuals to explore the deeper recess of themselves and uncover the well of wisdom present within. With the help of colors, collaging and writing I help people uncover a way to stay connected with an inner voice that will guide them towards living the life they are truly called to lead. I also conduct 8 class individuals sessions for those interested in cultivating a Creative Journaling practice. If you cannot come to the workshops or want a taste for what creative journaling & Intentional Living really feels explore our library of resources here. Our emotions can easily overwhelm us and make us say and do things we later regret. There is a better way to work with our overwhelming emotions that can help us understand ourselves and other better and in turn allow us to use more gentle ways of dealing with our emotions as well as our sometimes burdensome situations. 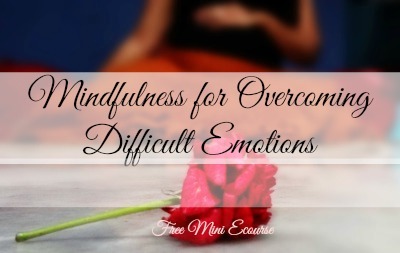 In my years of experience as a clinical psychologist and a mindfulness student and guide I have identified a mindful way of working with difficult emotions that can help us live more peacefully and intentionally. Click on the image to learn more about the seven lesson free mini-Ecourse. The course was indeed helpful. The way I look at it, I am trying to make a habit out of the pattern of thinking you have recommended. The first few days are already showing good results and I feel much better, but I really want to make a strong habit so that I can steer more steadily towards mindfulness.Thank you so much for all your help. I have gained immensely – I was surprised how I was able to rein in on some difficult emotions that have surfaced due to a recent unpleasant happening in my life.You’ve taught me that all is not lost. You advice came in at the exact right time – a waterskin to a parched wandering soul!- Narasimham. I am loving these exercise and the new journey that it has begin to unfold for me. Marsha Williams.